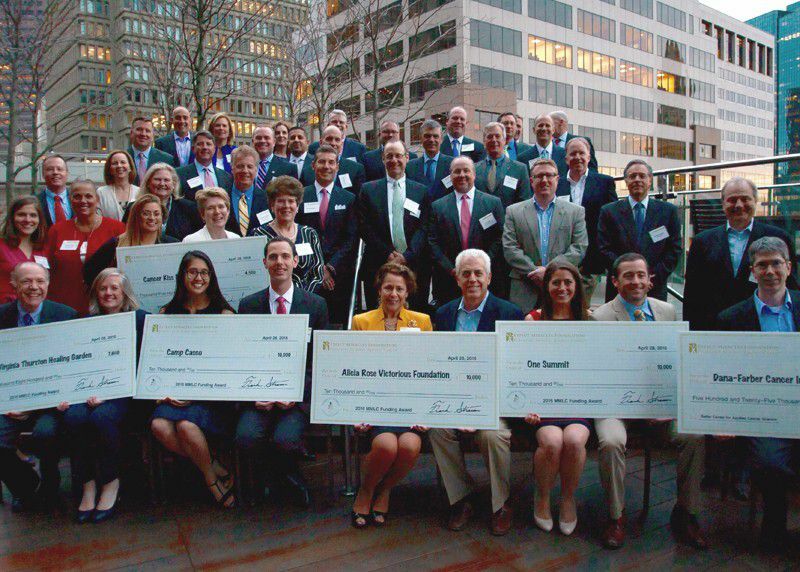 Expect Miracles Foundation was proud to host the 5th Annual Miracle Maker Leadership Council Funding Award Celebration on April 28, 2016. Eaton Vance Management graciously hosted the event in their beautiful café space. This event is the annual highlight for the Council as Members and guests hear from doctors they support at the Robert and Renée Belfer Center for Applied Cancer Science at Dana-Farber Cancer Institute, and recognize innovative cancer focused organizations and programs they fund. With the support of 33 new Members over the past 2 years, the largest gathering to date of over 80 MMLC Members and their guests were on hand to join in the celebration. Through the addition of the new members, the MMLC's impact was also amplified with record donations of over $160,000. This year's funding cycle provided $42,300 in funding awards to five deserving patient care organizations - the highest amount of funding ever to be provided at one time by the MMLC. Frank Heavey, the Foundation’s Executive Director, began the evening by thanking the Members for their support and leadership and shared a definition of leadership from the book, Lean In, that he believes embodies this group. “Leadership is about making others better as a result of your presence and making sure that impact lasts in your absence.” Thanks largely to the MMLC Members’ contribution to cancer research, as that is where 75% of their donations are directed, Heavey presented a $525,000 check to Dana-Farber Cancer Institute, representing Expect Miracles Foundation’s 2015 contribution to the Belfer Center. Dr. Mark Bittinger, head of target biology and target discovery at the Belfer Center, and Dr. Paul Kirschmeier, head of cancer therapeutics at the Belfer Center, accepted the check and shared a few words of thanks. Dr. Kirschmeier stated that as a direct result of MMLC contributions, the Belfer Center has developed a liquid biopsy which is minimally invasive and can indicate how well or poorly a particular therapy is working, and whether a tumor is drug-resistant, indicating a need for a change in treatment. Such a technology represents a major step forward for patients and doctors! Nick Nichols, from DST Systems, Inc., began the MMLC Funding Award Ceremony by presenting Cancer Kiss My Cooley, an Illinois-based organization, with a $4,500 award to provide 1 family with a Kiss of HOPE. The Kiss of HOPE program gives children with brain tumors and their families the opportunity to create happy memories and moments together to escape the everyday battle of cancer through financial assistance and a custom memory making experience that is specific to that child. Terence Faherty, from Broadridge Financial Solutions, presented a $10,000 award to the Alicia Rose Victorious Foundation, a New Jersey-based organization. The award will support the Teen Kit program, to produce, print and distribute 2,000 of the newly revised Totally 4 Teens Activity Journals. The Journal, which provides educational, creative, social, and psychological support to teens, will be updated with a new cover, design, poetry, artwork, calendars, inspirational quotes, games, and other elements of creative expression inspired by surviving teens and young adults. Gisele DiNatale, Executive Director & Co-founder of the Alicia Rose Victorious Foundation accepted the check and shared her first hand experiences she has had with young adults receiving Teen Kits from her organization, noting that she “had to do something” to help these children have a chance to be kids.